DRAFT ANALYSIS: "Behind Sam Walsh and Bailey Smith, Duursma is arguably the next most complete midfielder from Victoria, with top athleticism, leadership and defensive traits." 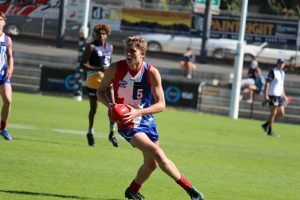 Gippsland Power skipper Xavier Duursma is a player that ticks so many boxes for AFL clubs, with his ability to play multiple positions and roles making him a genuine first round prospect after an excellent season on the field. Duursma always looked a draft relevant footballer in his bottom-age season for Gippsland, but those attractive attributes would only be present for short periods and were mostly seen in space. In 2018, he has become a far more consistent player and has balanced his contested and uncontested play superbly. He spent a majority of 2017 starting on the flanks or the wing, but has become a regular at the stoppages and through the midfield this year. His opening month and a half for the Power was simply outstanding, winning the ball at will and having a large influence on his side’s success. He was flying leading into the National Under 18 Championships and it was no surprise to see the utility replicate that form for Vic Country. He spent time in the midfield with success, but was especially impressive off half-back against South Australia where he proved his all-round talent and finished it off with a huge contested mark in the fourth term. He would have been mentioned during the All Australian discussions, but Vic Country’s poor campaign collectively did not help his cause. He returned to Gippsland exactly where he left off against the Western Jets, winning 26 disposals and hitting the scoreboard with two goals in an impressive display. His form never tapered heading into a finals campaign which saw his side as a serious threat, but it all ended in disappointing fashion as Gippsland fell to Oakleigh by 94 points in the Preliminary Final. Duursma’s reputation wasn’t dented on that day though, as he fought inside, attacked the ball aerially and at times dived desperately for tackles despite the game being out of reach from early in the contest. One of the most exciting things about Duursma is that his strengths run long and deep, while his improvements are short and solvable. He is an extremely flexible footballer, having shown traits and form in every area of the ground. A club will take him knowing it has the opportunity to develop him in any position they like. He is a serious athlete, possessing pace (multiple sub three second 20 metre sprints), an elite vertical leap in which he ranked third off the right foot at the combine jumping 83cm, agility and excellent endurance results (ran a 6-minute, 30-second 2km time trial and 21.1 on the Yo-yo test at the National Draft Combine). The best thing is that he uses these attributes on the field, which enhances his inside and outside ability. In congestion he can side step or spin out of trouble and accelerate away from the contest. On the flanks or wing, he runs and carries the ball with high metres gained and works hard on the spread offensively to get in dangerous positions forward of centre. Duursma’s marking ability and contested aerial prowess is arguably his most exciting feature, as he continually bats well above his average in this area considering his light frame. The way he flies into contests from any angle appears suicidal at times, but he backs his courage up with strong hands to often clunk the ball from difficult positions. These examples of determination earn the admiration of his teammates and they follow, while his off-field leadership is reportedly just as impressive. As already mentioned, Duursma does not possess a long list of obvious improvements, which is what makes him such a tantalising proposition. Kicking consistency is certainly an area where he can get better, mainly for the fact that he is really skilful by foot. He operated at just a tick under 56 per cent during the 2018 season, which is not horrendous when considering he won a lot more contested ball this year, but he has the potential to lift that dramatically. He has a long, penetrating right boot, but at times tries to take on low percentage options. Duursma is generally a very good decision maker, but I think he is just backing his ability to hit the target on these occasions and such turnovers are very correctable. The other identifiable improvement is adding muscle to that currently very skinny frame, but this is an exciting part of his development. Duursma has already proven that he is more than capable of performing at a high level at 71kgs, so filling out suggests that the ceiling is quite high. It will be fascinating to see what else he has to offer with a bit more beef and whether it will change his current style. Xavier Duursma is a rangy utility who has the potential to develop through the midfield, off half back or even as a difficult match up forward. His inside and outside attributes create enough appeal alone, but his aerial capabilities and courage add a dynamic that sets him apart. He will fight desperately in congestion, but next minute can be found in space carrying the ball or changing direction at speed. He balances his game arguably as well as any player available this year, which is complimented further by an outstanding athletic profile. He is a talent that certainly would not look out of place in the first round.